Qualifying to play in what’s traditionally (but not properly) known as the men’s State Amateur was among the 2018 highlights for the former Carly Dehlin, during the summer when she married BYU golfer Kelton Hirsch, a former State Am champion. 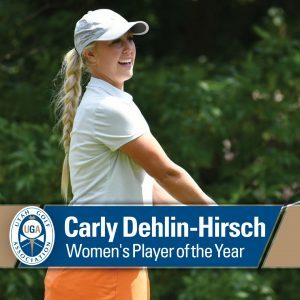 Yet that one-day golf achievement almost obscures the bigger story about Carly Hirsch, and how she became the UGA Women’s Player of the Year. “It’s awesome; kind of crazy,” she said. Both descriptions apply to her rise in golf, with phenomenal improvement that followed her enrollment at Utah Valley University. UVU coach Sue Nyhus saw an athlete who could develop as a golfer, and that has happened to a level beyond what she realistically could have hoped. A daughter of Devin Dehlin, executive director of the Utah Section PGA, Hirsch grew up playing mostly soccer. Her father has worked as a UVU assistant coach and helped her on the golf course, channeling her natural drive and athletic ability. Now playing her senior year as a graduate student, Hirsch has thrived with the Wolverines and performed well in amateur events. Her UGA season was highlighted by a victory in the Women’s Stroke Play Championship, as she shot 70-72 at Hobble Creek Golf Course, UVU’s home venue. Hirsch also tied for second place in the Siegfried & Jensen Utah Women’s Open, losing a playoff for low amateur honors, and finished fifth in the Mary Lou Baker Open. As the defending champions, she and partner Jessica Sloot took second in the Utah Women’s Four-Ball Championship, and then Sloot beat her in the Women’s State Amateur on the way to the finals.